The Week of Newshour — Avigail S. Oren, Ph.D.
Over the past seven days, I juggled so many different projects that by the time I sat down for dinner with my parents each evening it felt like two or three days had elapsed. 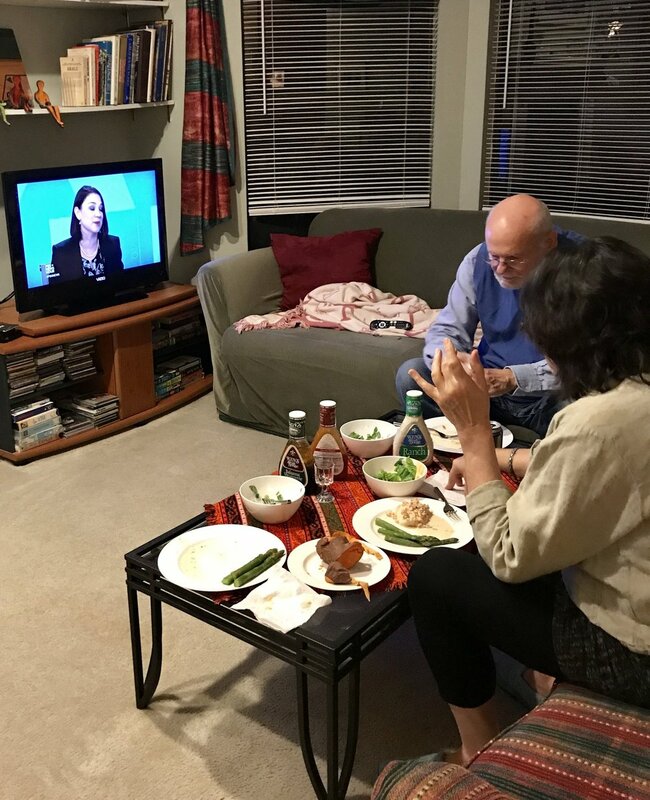 My parents, who never let us eat in front of the television when we were growing up, now regularly dine with Judy and Chris and Lisa and William and Yamiche and Jeffrey and Paul and the guests of the PBS Newshour. Clearly, even though we do not actually know these people IRL, they feel like family. I'm reading: The Sympathizer, still, because I got sidetracked this week by reading an almost-final draft of a forthcoming book for young readers. It should be released later this year, and, because it is so good, I will definitely write more about it. I'm listening to: Desert Island Discs from the BBC. I've been in a musical rut lately, only wanting to listen to the same familiar albums over and over again. Desert Island Discs is a great way to find new music (Welsh Miner's Choirs), or be reminded of old favorites that you haven't listened to in a while and now finally feel fresh again (Oasis). The concept is simple: each week a guest joins host Kirsty Young to share the eight tracks they would take with them if they were to be stranded on a remote tropical shore. Young is a crafty, experienced interviewer who never asks the same reductive questions--she manages to draw out new information from even the most media-trained celebrities. So you hear interesting stories, learn from accomplished people, and listen to (mostly) great music. And it will make you begin to wonder what eight tracks, book, and a luxury item you would take with you if (god forbid) you were cast away. I'm watching: The Olympics, duh. For two weeks every other year, I pack away my cynicism and blind my critical eye and become a rabid patriot. It's a holdover from back before I knew better, and I feel like if I kill the enthusiasm I'm also killing a piece of my childhood.